Classical modal logic with transitive closure appears as a subsystem of logics used for program verification. The logic can be axiomatized with a Hilbert system. In this paper we develop a constructive completeness proof for the axiomatization using Coq with Ssreflect. 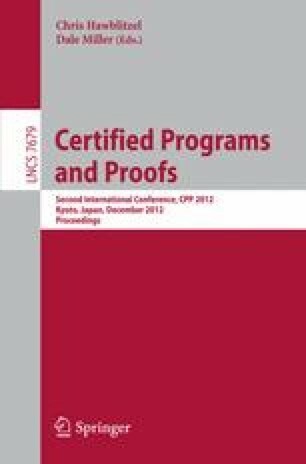 The proof is based on a novel analytic Gentzen system, which yields a certifying decision procedure that for a formula constructs either a derivation or a finite countermodel. Completeness of the axiomatization then follows by translating Gentzen derivations to Hilbert derivations. The main difficulty throughout the development is the treatment of transitive closure.